A person travelling in the path of Jnana doesn’t own any object in this world. But a person trading the path of karma owns every object in this world. The Kalpavriksha (wish fulfilling tree) and Kamadenu fulfill only what we desire. But the presence of a satpurusha fulfills even those that are not desired. A visit to a satpurusha benefits you more than any amount of travels to pilgrimages or rituals yagnas or yagas. When an incarnation or jnani takes birth on this earth all the good hearted people are liberated. It is because their hearts are always pure and straight. But the worldly people are always bent aside with impurity. Therefore they can never accept the glory of the holy people (mahatmas). When water falls, it can never fall into a bowl that is turned upside down, but can only fall into a bowl that is in erected position. The worldly people are like the bowls that are turned upside down. Sadguru Nanna Garu - "Jnana - Part 1"
Sadguru Nanna Garu - "Jnana - Part 2"
Sadguru Nanna Garu - "Jnana - Part 3"
Sadguru Nanna Garu - "Jnana - Part 4"
Sadguru Nanna Garu - "Likes & Dislikes"
Sadguru Nanna Garu - "Maya"
Sadguru Nanna Garu - "Courage"
Sadguru Nanna Garu - "Religion & Society"
Sadguru Nanna Garu - "Ego"
Sadguru Nanna Garu - "Relationship"
Sadguru Nanna Garu - "Food"
Sadguru Nanna Garu - "Mind"
Sadguru Nanna Garu - "Friendship"
Sadguru Nanna Garu - "Ishwara (God)"
Sadguru Nanna Garu - "Moksha (Liberation)"
Sadguru Nanna Garu - "Jnani"
Sadguru Nanna Garu - "Short and Sweet Answers by Bhagawan - 2"
Sadguru Nanna Garu - "Simple and Profound Quotes"
Sadguru Nanna Garu - "Short and Sweet Answers By Bhagawan"
Sadguru Nannagaru - "Bhagawad Gita"
Sadguru Nannagaru - "Words of Assurance"
Sadguru Nannagaru - "Never Mind Quotations Part1"
Sadguru Nannagaru - "Never Mind Quotations Part2"
Sadguru Nannagaru - "Never Mind Quotations Part3"
Sadguru Nannagaru - "Never Mind Quotations Part4"
Sadguru Nannagaru - "Short and Sweet Teachings Part1"
I knew Nannagaru from my childhood, but spiritually I got introduced to him in 1957. During the early days, he used to regularly conduct meetings in Chintaparru. In the midst of coconut trees and greenery we both used to travel by cycle and he being seated backside of my cycle. My mind used to jump in joy as we chatted, but seeing his trouble I used to feel bad. He used to say without inch of trouble you’ve brought me here Subba Raju garu. I always had a feeling that I am escorting God himself. As I remember, those incidents are still fresh in my mind and are joyous experiences. Every Sunday three or four of us would get together and would go to his home, he would share lot of spiritual experiences with us. He was youngest of all of us. The group that started with four has now become a source for lakhs of devotees. I was overwhelmed by Nannagaru’s love on the humanity. “Since we don’t know of those details we are here” Nannagaru replied. We went onto the road, we bought bunch of bananas as we proceeded on Jatka. As we stepped into Ramana Ashramam, we saw Satyananda sitting by window in Bhagwan’s hall (stone idol). From 14 years he was in silence. His work was to feed peacock. Seeing us he called us. They offered accommodation for us in Gentle man room which was extended to Gosala in Ashramam. Apart from Nannagaru, we happened to visit devotees who were alive in Bhagawan’s time like Krishna swamy, Annamalai swamy, Murugunar. Murugunar talked a lot, he was a simple man. We happened to visit Sri Ramaswamy Pillai, the one who used to take care of cleanliness of Ashramam. We also met foreign devotees like Chadwic, Osborne. They used to sit on their knees and offer prayer (Veda parayanam) very diligently. 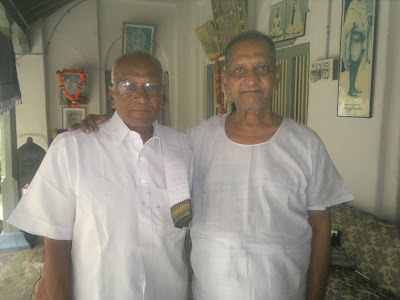 We would go with Nannagaru for Giripradakshinam; we also made friendship with Chalam garu. From Arunachalam we went to Rameshwaram. We had to sleep on veranda. Nannagaru once got up in midnight at 1 or 2 and sang “Endaro Mahanubhavulu andariki vandanamulu” song very sweetly for half an hour. He likes that song a lot. He continued to chant Siva, Vasudeva Narayana. I felt to be the luckiest person visualizing him. We took ocean bath in Danuskoti. On our way back we visited Madhura Meenakshi. In Aravind Ashramam (Pondicherry) we met Maataji. During this journey, he transformed spiritual energy and strength onto me. Without any reason I love him a lot, and have immense liking for him. I don’t know why, but everyday I anxiously waited for the work to be completed, so that I could meet him. As I used to work in the farm, mentally I was always connected with him. As I completed all my farm work in the evening, I rushed to be in his presence. He explained many things to us, which has hidden within Vedanta. I was able to grasp those words. My address was my home, farm and Nannagaru’s home. The days passed by just like that. Those are the wonderful moments of my life which I can’t forget till date. Many times I visualized in him the form of Buddha and Ramakrishna. I can’t explain my relation with him in words. I would love to do his work. He was a compassionate person. He always thought welfare of others. He never thought of himself. After our friendship, Badhriraju, a PWD engineer used to visit Nannagaru in evenings at his home. He used to chat with him almost until 8 PM, and left for his last bus. I also accompanied with them happily. I never felt hunger in his presence. All hours would pass like seconds. He can command, but he never did so. His words were heart melting as he showered love on us. In all these years with him, he always addressed with respect for the people who were younger than him also. I always love the work that he assigns to me. I never felt a pinch of toughness. These worked on me spiritually as well. Nannagaru spent most of his time in his Books room. Our friendship is not a normal friendship; it is a bound less friendship. If he offered me a bitter fruit among all the fruits, without a minute of hesitation I will happily have that fruit. I wouldn’t have a feeling that he offered me a bitter fruit, because I just love him for no reason. Why so? Because I knew that he is doing this for my good. And he knows all my good and bad. With his companion I felt peace and I wanted to share with all people around me. When I mentioned the same to him, he replied – “Subbaraju Garu! We should not reveal all these things outside; internally we need to strengthen ourselves”. Though he is younger than me, I like respecting him. From the time I met him in 1957 till date there is no change in our friendship. It’s the same day as it used to be. Though I am not able to have his darshan often because of increased devotees I didn’t feel obsessed as I always felt his mental presence. Having born as human is strength of purity, having born in his village is boon of previous life, and by travelling with him my life attained fulfilment. Only the one who overcomes time and lust can become Jnani. He becomes Jnani who sacrifices himself for the sake of self. Every king cannot become a jnani but when Jnani becomes the king, people will enjoy great prosperity. That is the reason we still discuss about the Rama Rajyam (Kingdom of Rama) till date. Jnani has no work either in this world or in the other worlds but still work is carried through jnani. Jnani has nothing to do but things happen through him. Jnani has come into this world only to lead the society towards equanimity. It is only jnani who can love this world. Whose heart is filled with peace eternally can only love this world and not by them who always burn in the fire of ego. Jnani’s sight is that of Shiva (self) and ajnanis sight is that of slave (corpse). Jnani is an embodiment of silence. But as our intellect doesn’t understand the silence, out of grace, Jnani preaches us through words. Jnani need not think of helping this world, but the mere sustenance of his body benefits the world immensely. Jnani never thinks that the world is benefitted through him. If he thinks so how can he become a Jnani? I was in a big dilemma whether to go to Arunachala Deepam on Nov 21 2010 or not. I phoned a close associate of Sri Nannagaru and he asked Sri Nannagaru about this. Sri Nannagaru said “Wont be there a heavy rush…” or some words to that effect. I was not able to get a concrete reply. I phoned him after a few days again and this time when he enquired the response was more positive. “Ask him to take a flight and come” He had told his associate. I was communicated the same and I happily booked a flight on 21st morning from Hyderabad to Chennai. I reached the airport in the early morning and boarded the flight. During the journey I had a surreal revelation. The flight was landing and the sun was up. It was being reflected in the waters below and I noted with amazement when the flash of the sun blinded my eyes when it hit a clear water body. I also saw that the sun was more dull in murky water and was totally absent when solid land came. This is it! I thought excitedly. The Atman is always there. But if the mind is unclear or opaque due to thoughts it is not known to exist. But a pure mind will reveal it. I knew this truth before but to see it from a flight on a day of the Deepam was highly revealing. On landing I took a taxi and raced towards Tiuvannamalai. I reached Tiruvannamalai by afternoon but there was a huge rush of cars trying to get into the town and there was a serious jam. I got out of my taxi and instructed my driver to remain there for the night whence I would come back again to return. I took an auto on the outskirts of Tiruvannamalai and asked him to drop me in Ramanashram. The auto driver had looked at me wide eyed and told me that it was next to impossible. I promised him 400 rs and he readily agreed. It takes 400 rupees to convert impossible to possible on Deepam day I thought. On landing in Chennai I had called a friend in Tiru who had promised to book a room for me in Ramanashram. On hearing that I had not felt worried. I thought of Sri Nannagaru. “I am coming to you and the responsibility is yours “ I said. Now as the auto rushed through chaos and dodged angry policemen I reveled in seeing Arunachala in various darshans and angles. “I will not fret nor be irritated at this at all” I told Arunachala. “If you make me go round and round like this I will watch the Deepam standing even on a drain pipe!” I jokingly told It. I finally reached Ramanashram after a long time. There was a huge mass of people filing past it on the Girivallam route. I approached the ashram accommodation manager and asked him for a room. I was pretty sure he would refuse with so much of rush of people. But surprisingly he had a room…in the ashram compound! Just next to the Dining Hall. I happily took the room and got ready to meet Sri Nannagaru. I had not eaten since morning except for a banana and I was slightly hungry. When I reached Sri Nannagaru ashram I went to the Guru’s room. There was already a huge rush of people in the ashram and many were there waiting for him outside his room. I entered his room along with some of them. He asked for a chair to be placed for me. I prostrated to him and sat beside him. “You have been delayed in coming here” he said smiling at me. I knew that he was aware of my adventures on the auto and also my friendly taunts of Arunachala. Next a young couple brought there infant daughter to him and asked him to name her with a name with the same significance of Arunachala. Another devotee asked him for mantra deeksha. “Om Namah Shivaya, Shivaya Shivaya, Om Namah Shivaaya etc” he said. Another devotee came and told him that his wife’s boss was creating a lot of trouble for her. The man too left happily. “You are feeling Peace, yes?” he asked. 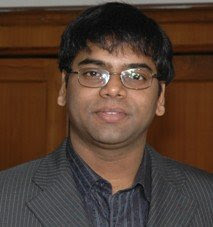 I had a recent experience of peace while watching Robot movie of Rajnikanth. I doubted it. But Nannagaru asked me about it and laid to rest my doubt. It followed a scene where Rajnikanth is shown as the Divine Mother and something in me looked at the scene in tremendous awe. Awe and worship welled up in my heart for the Supreme Devi. Subsequently in a few mins I suddenly lost my body conciousness and my mind. I was an infinitesimally small point of infinite peace. I was not someone or something. I just was. I felt I was the Universe in a nutshell. It was a peace I never knew. A peace that was incapable of the mind. I could see my friends and others in the movie hall but I could not see myself for I was the Universe. A point of extreme peace and extreme Universality. It was as if the world had decided not to exist in that small ball of peace which I was. Outside there was all chaos but in that ball of peace I just was. It had no attachments, nor joy, nor sorrow. It was transcendental. And it was Me. I encompassed the entire cosmos but was not of it...it is very difficult to describe that state. It was like a tap of water with thin stream of water trickling, dripping infinite Peace. It lasted a few seconds and then was over. I immediately knew that I had had that experience out of Pure Grace of Guru alone. “But what about my lunch?” I thought. He looked at his attenders. “Is my food ready?” he asked. When they nodded he got up to go to the next room. I too went inside and sat down before he could come. We were about five people in the room . He came, sat down and ate for fifteen minutes. As he finished I noticed with a peculiar curiosity that my hunger was appeased. I had lost the craving for food or water. What is this leela? I thought. I did not touch a morsel of food that day except for a solitary banana in the morning. I was a voracious eater and here I was at 5.30 in the evening having my hunger appeased and thirst quenched when Sri Nannagaru had finished his meal. God satisfied, the whole world is satisfied. I was noting all this with a subtle awe in my being. Even though he said those words I knew he knew that I knew. He smiled and gestured me to follow him downstairs where they would light the deepam following the Maha Deepam on Arunachala Hill. One who follows the Jnana path will think nothing belongs to him, where as one who follows Karma Path will think everything belongs to him. The Guru was still and quiet today in the satsangh . He opened his eyes and looked at everyone. His gaze fell on me. His eyes scanned my eyes and mine His. He looked for sometime and then folded his hands in namaskaram to the devotees around. This was meant to mean the end of the satsangh. He scanned the entire room with his eyes. He then looked at me again. As he shifted gaze I got up. He then looked at me again. "Grant me Pure Desirelessness" I pleaded to him mentally. He looked at me and then his gaze for the first time in my life rested on my chest. He looked at my chest for a minute. Then he looked again into my eyes and slowly went into his room. In the afternoon I hastened back to the flat in which Sri Nannagaru was staying in Chikkadpalli. Just a few minutes back I had experienced a bout of pure jealousy and felt sad. I could feel the sensation of jealousy exactly in the area where Sri Nannagaru had seen me in the morning. This jealousy was triggered due to professional rivalry and I was sad that negative states like jealousy came over me. I tried to do a lot of self enquiry to root out the emotion but small traces of it were left. I repeatedly prostrated to my rival mentally to assuage my guilt. I felt sad that in the morning I had asked my Guru deirelessness and here I was jealous of someone becoz of stupid desires in me. Subsequently I felt much happier when another contrary incident brought back my equipoise. I felt sad but that I depended on external things still for my happiness. I wondered what Guru will think of me. I went up to the flat worried a little. An aunty came to me and said " O Mithin. You just missed him. He was siting here for sometime and now he just went back to his room a few seconds ago." I wondered whether it was becoz I had been jealous of another. I repented again and imagined myself prostrating to my rival. I also imagined myself in my rival and wished him all success. After sometime Sri Nannagaru came out and went walking out towards the lift. Even though we were just ten of us he did not look at me. As he waited for the lift, multiple thoughts ran in my mind. Was he angry with me? Did I fail him? There came a point when I was just beside him and he didnt look. I resigned myself to fate and kept looking at him. I remembered what Greeshma had told me once. She had said " Even if the guru looks at you or not, he showers Grace at all times." It was then that we noticed that the lift was stuck on a lower floor. It was not coming up. The devotees were getting restless but Sri Nannagaru was peace personified. I happily ran down three floors and got into the lift and went up. I saw a devotee smiling at my good fortune. Sri Nannagaru saw me and entered the lift. He looked at me and said " Dont you have work in the hospital?" I shook my head happily. "I have a sore throat. I will not speak for long in the meeting" he said. There was a lecture meeting in a huge auditorium in a few mins. He got into the car and left for the auditorium. During the lecture in the auditorium he said at one time " Our Dr Aachi has given another name to Arunachala. He called it Karunachala. Karuna means Grace. Everything depends on Grace." I surprisingly didnt feel elated or body conscious wise but felt happy at his love for me. Oh! How you bear this weight of this imperfect impure ego O Lord, I thought. With the baddest of sore throat, I saw my Guru deliver a two hour long lecture on Jnana. I marveled at his compassion. On the next day, I reached the flat in which Sri Nannagaru was staying in the morning. As the lift was crowded I took the steps to the fourth floor. I am climbing Tirumala Hills to meet Lord Venkateshwara I thought happily. We sat in the room and waited for him. He came slowly and saw me and patted me and smiled. Next he meditated for some time in Mouna. Then he opened his eyes and asked Dr Usha to call a devotee whose relative was unwell. He talked with the devotee on phone and said that he would like to come and see the patient in the hospital and then his mind would be at rest. I marveled again at his compassion. Next 30 mins he went into deep Silence. I did a little self enquiry and pleaded him mentally to give me Pure Desirelessness. He opened his eyes and I saw an amazing thing in him. He looked like Pure Desirelessness Itself. Not a muscle twitched , not a wave could be seen. But a pure state of Being. His eyes were vacant, his mouth was open partially, his cheeks were sagged down a bit and the curves of his mouth were dropped and solemn. I worshipped his desireless form mentally. Next he looked at a boy next to me and said " Does this boy have a Lord Subramanya temple next to his house?" One of the devotees said yes. "Good. Go and see Him now and then." He said and smiled. The Desireless form now transformed into that of Amazing Love. His whole form radiated LOVE. He looked at me and I knew instantly that he knew I was seeing that form in him. And then he did a namaskar and went away to his room. In the room I met him again. He said " " You have good heart and are very intelligent. Both combinations are rare.It is a gift from God. Don't neglect duty. You have to use your intelligence for benefit of society."